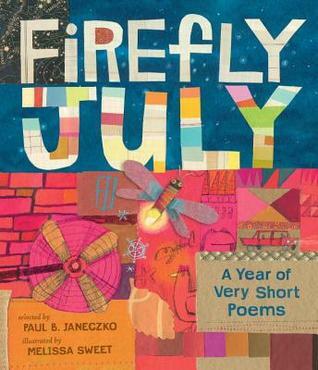 Firefly July: A Year of Very Short Poems selected by Paul B. Janeczko, illustrated by Melissa Sweet, is a collection of some of the most recognizable poems, including William Carlos Williams’ The Red Wheelbarrow, for readers ages 6-9. Most of these poems are short and fit the theme of each season — winter, spring, summer, fall — but even younger readers will enjoy these poems as they are read aloud by their parents. The illustrations are colorful, and the vibrant images perfectly capture the mood of the season. While some of the concepts in these poems are a little above where my own daughter may be cognitively, she still enjoyed listening to me read them aloud. I also made sure to denote which season was depicted by each of the poems in the section, and had her point to images in the poems that she found in the illustrations, which kept her attention focused. For instance, for Raymond Souster’s poem, “Spring,” the illustration depicts the roots of the flower and the beets on the page and the flower and leaves above. on which young birches are treading. For “The Island” by Lillian Morrison, my daughter looked for the elephant talked about in the poem, and quickly found that he was the island with the trees on top. It became a word game for us, and while some poems don’t lend themselves easily to these kinds of games to keep a toddler’s interest, my daughter also loves the sounds of words, so she would often just sit and listen to me read the poems. Firefly July: A Year of Very Short Poems selected by Paul B. Janeczko, illustrated by Melissa Sweet, contains not only those well-loved and classic poems from Williams, Dickinson, and Frost, but also poems from more contemporary poets, like Ted Kooser, Hughes, and Crapsey. Such a wide variety in a collection of poems about the seasons offer a great deal of teaching tools for young readers, from learning new words and how language works to what happens in each season scientifically. Paul Bryan Janeczko is an American poet and anthologist. He has published 40 books in the last 30 years, including poetry compilations, non-fiction guides for young writers, and books for teachers. Melissa Sweet has illustrated nearly 100 children’s books from board books to picture books and nonfiction titles. Her collages and paintings have appeared in the New York Times, Martha Stewart Living, Madison Park Greetings, Smilebox and for eeBoo Toys, which have garnered the Oppenheim and Parents Choice Awards.